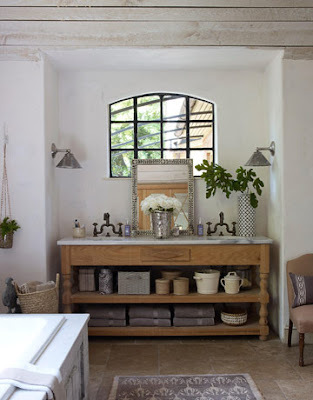 I've become completely enamored with the cover house featured in December's House Beautiful. Why? Well, first off because it looks like this. 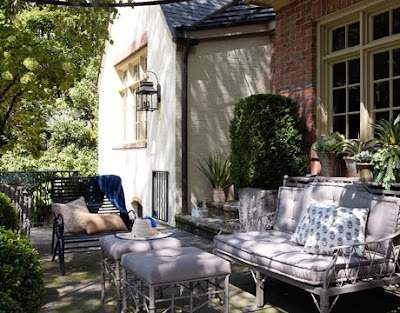 Secondly, because interior designer and Ballard designs creative director, Jill Brinson, designed the home to feel as though it's located in the countryside rather than where it really is: smack dab in the heart of Atlanta. That's right. Next door to her house is a 20-story apartment building. You'd never guess by the look of this oasis, complete with lush green landscaping and surplus of natural light, that this home is in an American city rather than the rolling hills of France. Brinson's home comprises my favorite type of interior design; an eclectic collection of furnishings that have been acquired over time. Items derived from antique shops, markets, chain stores, and worldly travels while others are pieces passed down from family. For example, Brinson's living room features an original Moroccan tapestry shown hanging from the loft, an antique French industrial table centered in the space, and mirrored sconces above the settee that Brinson describes as "earrings for the wall." 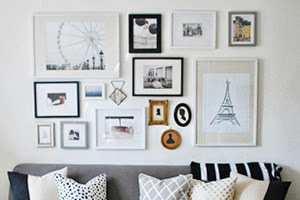 Note: You can find similar sconces at West Elm right now! I hope to add a pair of these to my new home. Hint, hint, Secret Santa. The table below also sits in the living room. The wood you see creating the doorway on the right are salvaged barn beams. And I am not positive, but I want to believe that's a white lacquer parsons desk on the far right. What home is complete without one? 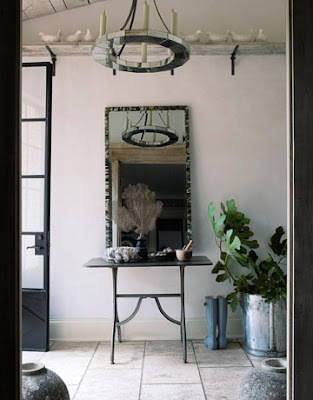 This entryway perfectly sets the tone of the house: relaxed yet put-together. 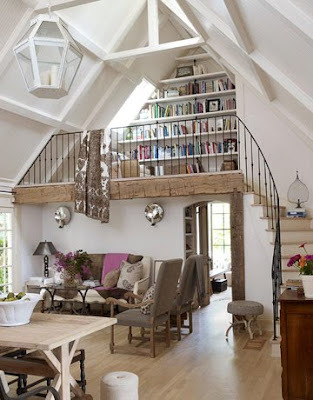 It combines a lot of light colors and natural materials. 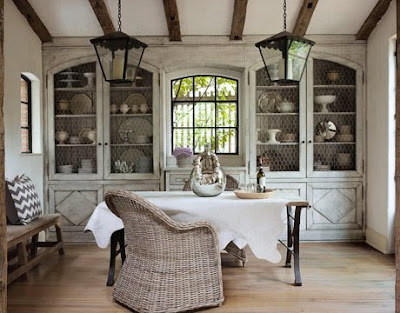 I also love the pairing of woods with metals, shiny fixtures with weathered furniture. My favorite thing in this room though is the mirrored lighting fixture, which I believe holds candles rather than electrical lights (but I could be wrong). Oh, and the rainboots, of course. The dining room has no set seating arrangement. Brinson says when she and her husband entertain, they make use of the bench currently placed along the wall and grab stools from around the house. 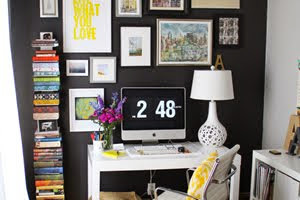 I love the entire look of this room. This is what I imagine homes looking like in the French countryside. 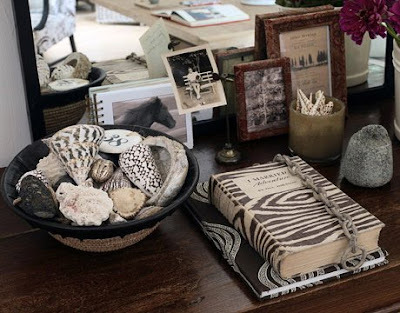 I am not sure where in the house this vignette is located, but I spy a hard-to-find, antique copy of Osa Johnson's "I Married Adventure," currently available at Matters of Style's new online store, along with its partner, "Four Years in Paradise." Wow. This image speaks for itself. The one thing I will point out is the collection of white serving dishes perfectly displayed in front of the oversized windows. You hardly notice them with that vivid backdrop. I imagine the view is equally stunning on a rainy day as it is when the sun is shining. Like many designers now a days, Brinson chose to replace upper cabinets with open shelving, the goal being to let even more light pour in from the many windows. What a great place for entertaining on warm summer nights. 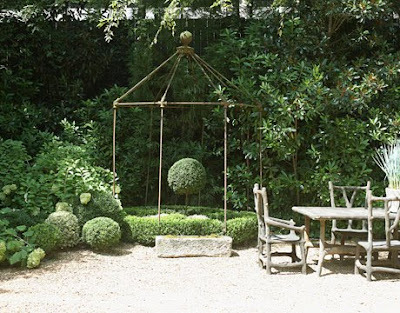 It's the perfect mix of formal (with its manicured landscaping) and rustic (the unfinished wooden table and chairs). 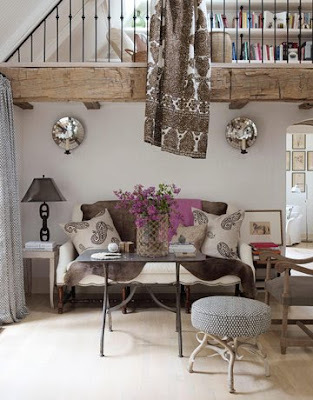 The fabric wall covering in this room is stunning and part of Brinson's textile collection. I love that this room has both a work table and a writing desk. Very practical. 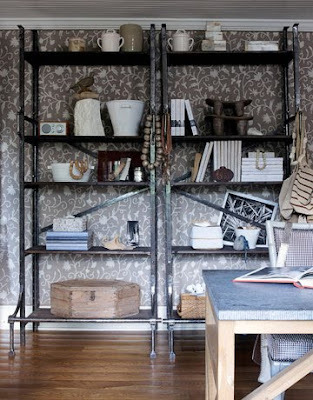 These industrial shelves are from a factory in Poland but littered with a combination of modern and antique objects. 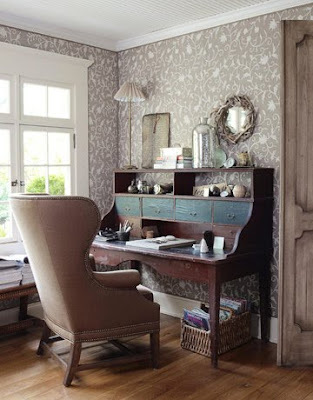 The writing table is a French antique and I just love the chair from Interior Philosophy. Perfect to sit back and cozy up when writer's block strikes. I imagine Jane Austen sat down to a similar space when she wrote her great works. Or maybe that's just me romanticizing the space even more. 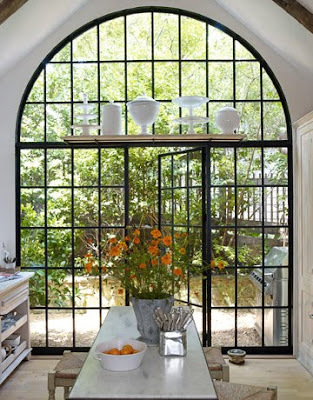 More great windows, and I love the mix of colors grounded by the neutral taupe throughout the space. I also really like this canopy bed, a look I normally shy away from because they tend to look heavy and formal and honestly remind me of Ebenezer Scrooge's bed from A Christmas Carol. But this style is light and unimposing. Again, as in the kitchen, I love the open shelving in lieu of covered cabinets. This tub makes me smile. I love the rustic-ness of this home.